Join Us!!! 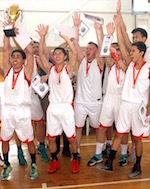 We are looking for someone to help us cover Kyrgyzstani basketball. Please send us an e-mail. The game had a very big importance for second-ranked Guiness-29 as it allowed them to take a leadership position. Guiness-29 smashed 5th ranked AUCA at home 71-51. Guiness-29 have a solid three-game winning streak. As mentioned above they are at the top of the standings, which they share with Tulpar-SKIF. AUCA lost third consecutive game. Newly promoted team keeps the fifth place with three games lost. Bottom-ranked SHUM (0-4) tried to put together a comeback for its first victory of the season, but they fell short in the 83-42 loss to third ranked Moy Telefon (3-1) in . Moy Telefon have a solid three-game winning streak. They maintain third position with 3-1 record having just one point less than leader Guiness-29. Newly promoted SHUM still closes the standings with four games lost. Bottom-ranked Grizzly (0-3) tried to put together a comeback for its first victory of the season, but they fell short in the 91-55 loss to fourth ranked Politekhnik (2-1) in on Sunday evening. Politekhnik maintains fourth position with 2-1 record. Grizzly at the other side still closes the standings with three games lost. My Phone clinch 2018/19 title as they defeated SC Politechnik 87-63 in the Final game. Trailing 2 points at the halftime, My Phone needed a strong second half to seal the win. They posted a 27-17 surge in the third period and closed the game with the final 23-7 burst. Zhanarbek Engelsov top-scored for the winners with 28 points and Andrei Pashenko (C-86) notched 18. Dmitrii Ostroverkhov (PG-90) poured in 12, whilst Zhanysh Adiev (SG-90) had 11. Roman Gostishev (197-PF-97) replied with 25 points and 16 rebounds, whilst Sherzat Kenenov (174-SG-98) brought 15. SC "Politechnik" and BC "My phone" reached the Final as they won the semifinal clashes against their opponents. BC "My phone"overcame BK "Tulpar SKIF" 69-52 as Zhanysh Adiev (SG-90) stepped up with 34 points and Engelsov poured in 20. SC "Politechnik" edged BC "Gines 29" 80-72. They achieved the victory mostly due to the strong first half as they won 46-30. 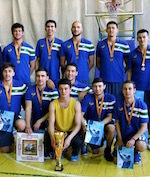 Syimyk Esenaliev (181-PG-00) top-scored for the winners with 28 points, whilst Nursulta Adylbek had 14. The most exciting game of round 14 in the Liga Forward took place in . This derby game ended with only one-point defeat on the road of 6th ranked Grizzly (2-10) to fifth ranked AUCA (4-8) 84-83 in the game for the fifth place. Newly promoted AUCA maintains fifth position with 4-8 record. Grizzly at the other side keeps the sixth place with ten games lost. An interesting game for Guiness-29 (12-0) which hosted in 3rd ranked Tulpar-SKIF (8-4). Top-ranked Guiness-29 had an easy win 77-46. Undefeated Guiness-29 have an impressive 12-game winning streak. Defending champion maintains first position with 12-0 record. Tulpar-SKIF lost third consecutive game. They keep the third place with four games lost. Bottom-ranked SHUM is still unable to win any game. This time they lost on the road their 12th consecutive match to fourth ranked Politekhnik (7-5) 88-52 on Sunday evening. Politekhnik have a solid four-game winning streak. They maintain fourth position with 7-5 record. Newly promoted SHUM still closes the standings with 12 games lost. An interesting game for Guiness-29 (12-0) which hosted in 3rd ranked Tulpar-SKIF (8-4). Top-ranked Guiness-29 had an easy win 77-46. Guiness-29 have an impressive 12-game winning streak. Defending champion maintains first position with 12-0 record. Tulpar-SKIF lost third consecutive game. They keep the third place with four games lost.